Proponents on the expensive and ineffective War on Drugs would have you believe marijuana is bad, so bad in fact that it can drive people to commit crime. 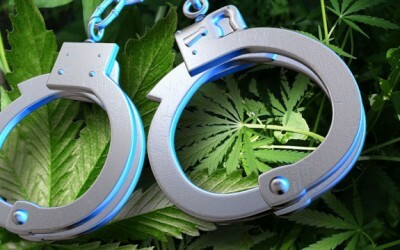 Law enforcement and anti-marijuana lawmakers alike frequently connect marijuana to crime and say making the plant more widely available would turn the country into the wild west—pushing crime rates up as access to marijuana increases. But two recent studies suggest the opposite is true—that access to marijuana actually leads to decreased rates of some of the most serious crime. One of those studies, recently published in PLoS ONE, concluded that marijuana access is not related to any increase in crime, and is instead linked to a decrease in homicide and assault rates. According to AlterNet, researchers with the University of Texas at Dallas tracked crime rates between 1990 and 2006, looking specifically at those states that made marijuana more readily available, including those with liberal medical marijuana policies. It was the first study to compare changing marijuana laws with crime rates, and had some surprising results for those who advocate for an all-out ban on cannabis. “The central finding gleaned from the present study was that MML (medical marijuana legalization) is not predictive of higher crime rates and may be related to reductions in rates of homicide and assault. Interestingly, robbery and burglary rates were unaffected by medicinal marijuana legislation, which runs counter to the claim that dispensaries and grow houses lead to an increase in victimization due to the opportunity structures linked to the amount of drugs and cash that are present,” wrote the authors. An earlier study had similarly positive things to say on the effects of marijuana availability. This one, published in the Journal of Law and Economics, looked at how medical marijuana laws affected the incidences of alcohol-related traffic deaths between 1990 and 2010. These are far from the only two studies that show the marijuana-criminality argument invalid. In 2011, a similar study published by the Rand Corporation found “no evidence” that medical marijuana led to increased crime rates. “Disturbingly”, as AlterNet reports, the Rand Corporation recalled their study after the LA city attorney’s office, who frequently linked marijuana and crime, launched a very vocal attack against the findings. In Colorado, where recreational marijuana is legal, crime has dipped in the past three months, since it became available in dispensaries. What these studies tell us isn’t only that marijuana opponents are wrong and misleading by painting a picture of “reefer madness” in the streets, but that marijuana availability could make communities nicer places to live. In our corporate dominated culture the only consideration is how will it affect the bottom line. So, it does not matter if even 99% of the population is for legalization of marijuana it will still remain a schedule 1 until the powers that be (read big pharma, alcohol manufacturers, prison/law enforcement) figure out a way to make marijuana legalization profitable for them. Not going to happen. If the facts show that it is safe they will make stuff up to keep it illegal. How long are we going to put up with this charade?